Millions of Americans looking after elderly infirmed family members at home suffer from impaired immune function, heart disease, and other factors resulting in a higher mortality rate. A new study finds Transcendental Meditation reduces stress in family caregivers. Perceived stress was assessed using Cohen’s Perceived Stress Scale (PSS). Results showed significant reductions due to practice of the TM technique. A pilot study published in International Archives of Nursing and Health Care (Volume 1, Issue 2) found the Transcendental Meditation technique helped reduce stress associated with care-giving over a two-month period. Research, involving 23 caregivers looking after a family member or friend with Alzheimer’s or other chronic medical conditions, found improvements in perceived stress, spiritual well-being and mood assessed by standard instruments. Qualitative evaluation suggested improvements in energy level and resilience and reduced psychosocial stress. Link: bit.ly/1oNH7kt. See the EurekAlert! press release with graphs, links, and personal accounts from several caregivers looking after loved ones at home. This scale shows an increase in caregivers’ spiritual well-being—a sense of meaningfulness in life and faith or optimism in the future—due to TM. 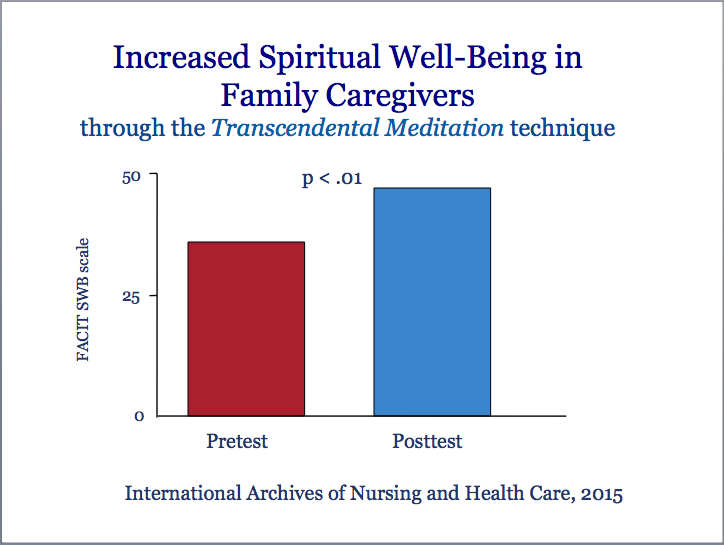 PRWEB: MUM Researchers Find Transcendental Meditation Reduces Stress in Family Caregivers. Researchers at Maharishi University and Kaiser Permanente Northwest found Transcendental Meditation reduced the stress associated with caregiving. A pilot study involving 23 caregivers taking care of a family member with Alzheimer’s or other chronic medical conditions experienced reduced perceived stress, improved well-being and mood over a two-month period. Some news reports: TMhome.com | Medical News Today | PsychCentral. In related news, read about The first Transcendental Meditation elective course offered at a major US medical school, and this Excellent article on Transcendental Meditation written by Sarah Klein in Prevention Magazine. This entry was posted on February 18, 2016 at 11:39 pm and is filed under Articles, David Lynch Foundation, Health, Maharishi University. You can follow any responses to this entry through the RSS 2.0 feed. You can leave a response, or trackback from your own site.